This code is a common code on an ES Scissor, most frequently generated by a battery connection issue or battery replacement. However, there is an easy fix. Simply go in with your analyzer under access level 1, change your model number to a different model and then shut the machine down with the e-stop switch. Power the machine back up and go in with your analyzer under access level 1 again and change the model back to the correct number. Shut the machine down with the e-stop switch and that should eliminate the code. Available for SkyTrak®, Gradall®, Lull® and JLG® lines of equipment, our telehandler filter kits help maintain and protect your investment. Kits are available in different hourly intervals and include factory-approved filters, with one convenient part number. Order yours today! Contact your nearest dealer to order your Telehandler Filter Kit. 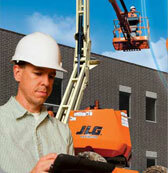 Have an account with JLG? 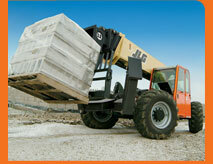 Visit Online Express to order your Telehandler Filter Kit. 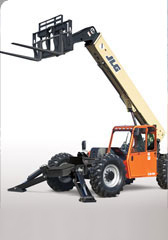 Starting in May, in concert with our Tier IV interim engine introductions, you’ll notice that our JLG-branded telehandlers will look a little different. We’re making global color changes so they maintain a consistent look, no matter where they are in the world. Learn more about these changes and see photos of the new telehandlers. We’re always seeking ways to improve and evolve our products. That’s why we want you to know about these upcoming changes. Because reaching out means keeping you in the loop. ClearSky Mobile App is Now Free! We are happy to announce some great news! The Near Me™ smartphone app is now free to all Web Center users with an active telematics services subscription. After downloading the app, users will require unique sign on credentials that can be obtained by calling the ClearSky support team at 877-554-5438. The Near Me mobile app is available for the iPhone, Android and BlackBerry.